Hardin HC, Salo J. Chapter 7: Conducting the Comprehensive Medication Review. In: Whalen K, Hardin HC. eds. Medication Therapy Management: A Comprehensive Approach, 2e New York, NY: McGraw-Hill; . http://accesspharmacy.mhmedical.com/content.aspx?bookid=2319&sectionid=180048105. Miller D, Roane TE. 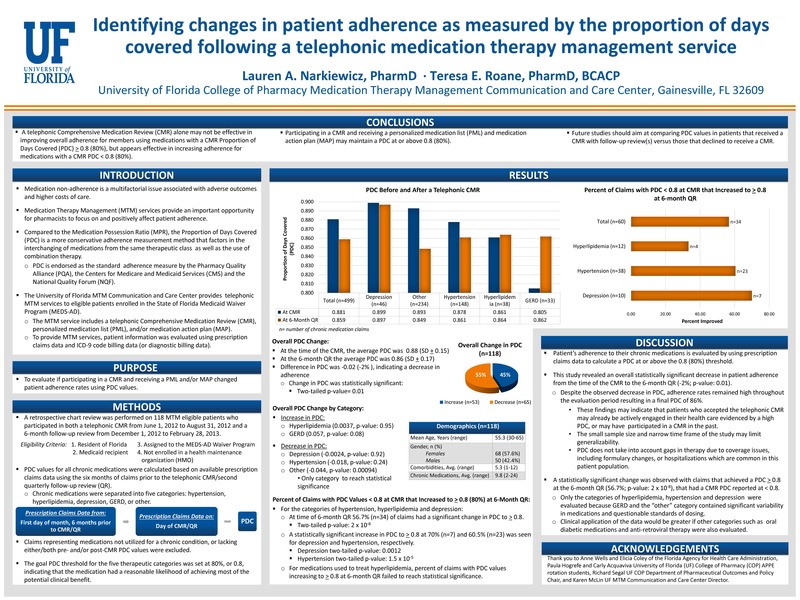 Reduction of 30-Day Hospital Readmissions after Patient-Centric telephonic Medication Therapy Management (MTM) Services. J Manag Care Pharm. 2015; 21(4a). Hardin H, Hood E, Narkiewicz L, Roane TE. Student perceptions before and after a medication therapy management advanced pharmacy practice experience. Am Jour of Pharm Educ. 2014; 78(5). Evaluating the Impact of Adding Patient-Specific Details into Physician Faxes on Statin-Drug Interaction and Heart Failure-Drug Interaction Resolution Rates: A Retrospective Study at a Medication Therapy Management (MTM) Call Center.